This is one of the easiest projects I've done in awhile! This is a 16 inch landscape brick that I've handpainted for the holidays! Here's the finished project nestled in the flowerbed next to the front porch. Check out those on-their-way-to-being-dead mums. Not my fault. I water...but Texas heat can be unforgiving. Here's the closeup picture again. I blurred out the address but you get how cute this is, right? 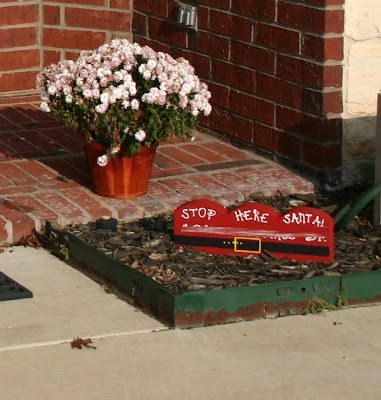 NO WAY Santa can miss our house now! p.s. 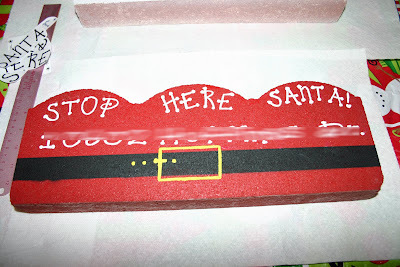 Another idea...can be personalized with names in place of "Stop Here Santa". Painting packets with full instructions for this project can be purchased on my Ebay or in my Etsy store. Other paver patterns also available! This project is also linked to Just A Girl's I Can Make That party. 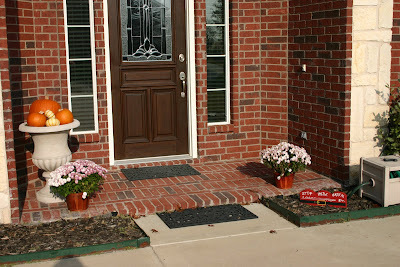 Check out all the cool projects on her blog!